Zachary Levi is the perfect choice to play an oversized kid. The superhero formerly known as Captain Marvel (not to be confused with the Captain Marvel from Marvel Comics, whose own movie, starring Brie Larson, is currently in theaters) is a wish-fulfillment fantasy for the target audience of kids and teens who were the main consumers of comic books when the character debuted in 1940. It's been decades since comic books and superheroes were considered something "just for kids," but Captain Marvel remains tied to his kid-focused origin. That makes the new Shazam! a bit of an awkward fit for a modern superhero action movie. The hero's origin remains pretty much the same: 14-year-old orphan Billy Batson (Asher Angel) is granted the ability to transform into a fully adult superhero (played by Zachary Levi) by uttering the word "Shazam," after he's chosen by an ancient wizard (Djimon Hounsou) who dubs him pure of heart. Billy remains an immature teenager on the inside, though, and he spends much of his time goofing around with his new powers while the evil Dr. Sivana (Mark Strong) plots his downfall from afar. 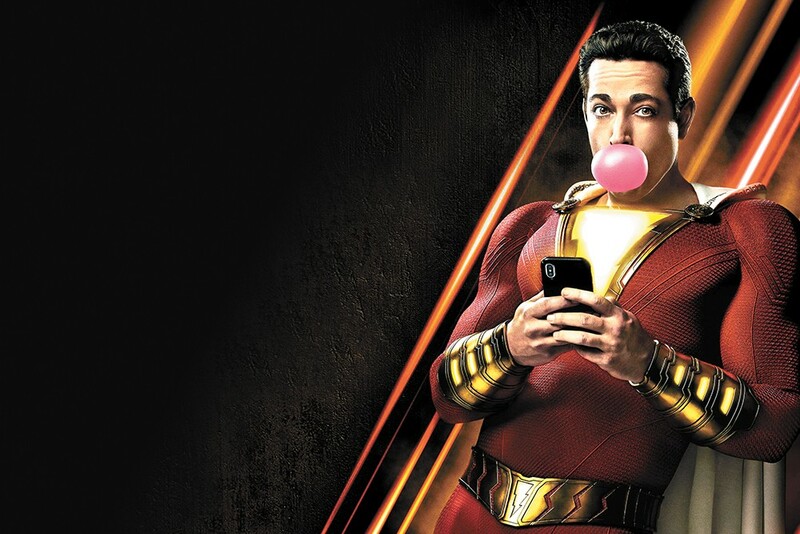 Although it's paced like a typically bloated large-scale blockbuster (Billy doesn't actually transform into a superhero until 40 minutes into the movie), Shazam! feels more like an overgrown Saturday morning cartoon, especially in the dynamic between Billy and fellow foster kid Freddy Freeman (Jack Dylan Grazer), a snarky superhero fanboy who's both fascinated by and jealous of his friend's newfound powers. Freddy is more annoying than endearing, and his relationship with Billy encourages the brattiest behavior from both of them. It's mildly amusing to see a bulked-up Levi in a bright red superhero costume binge on junk food and get flustered around his foster family, but the movie's one joke gets old quickly, and what's left is a slow, underwhelming superhero story, along with some equally slow family drama. Produced on a lower budget than other DC superhero movies, Shazam! occasionally looks somewhat threadbare, and the action sequences are more basic than the cataclysmic confrontations of previous DC movies (although this doesn't prevent the final battle from dragging on interminably). At the same time, the film is full of references to other DC movie superheroes, a remnant of the time when the company was attempting to build a cinematic universe to rival Marvel's. It's another instance of Shazam! 's confused identity, of trying to cover its bases both as a franchise building block and as a standalone narrative. The tone is similarly fractured, shifting from cheesy, kid-friendly jokes and life lessons to dark, violent material from Sivana, as if the two modes of DC films are battling it out within Henry Gayden's screenplay. Instead of bridging the gap between grim, gritty DC movies like Batman v. Superman: Dawn of Justice and Suicide Squad and the brighter, more upbeat DC successes Wonder Woman and Aquaman, Shazam! lurches clumsily from one to the other, never settling on a satisfying approach. It could be the superhero version of Big (there's even a nod to the Tom Hanks comedy's iconic giant-piano scene), but it can't get away from the needless angst and turmoil. The original print version of this article was headlined "Minor League Hero"